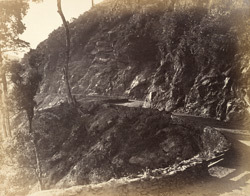 Darjeeling Hill Road. Three-quarter mile below Kursiong. bl.uk > Online Gallery Home	> Online exhibitions	> Asia, Pacific and Africa Collections	> Darjeeling Hill Road. Three-quarter mile below Kursiong.